There are an estimated 235,000 acres of seagrass beds found along the Texas coast. Seagrass is valuable habitat for fish and wildlife and provides many benefits to the entire ecosystem. Benefits include stabilizing the sediment; oxygenating the water column; providing food and shelter for marine life; reducing harmful bacteria; and reducing greenhouse gasses. Restricted to growing in shallow areas due to their dependence on sunlight, seagrass is particularly susceptible to boat propellers. Propeller scarring from boats passing through seagrass meadows can have devastating consequences for the marine organisms using seagrass as habitat. 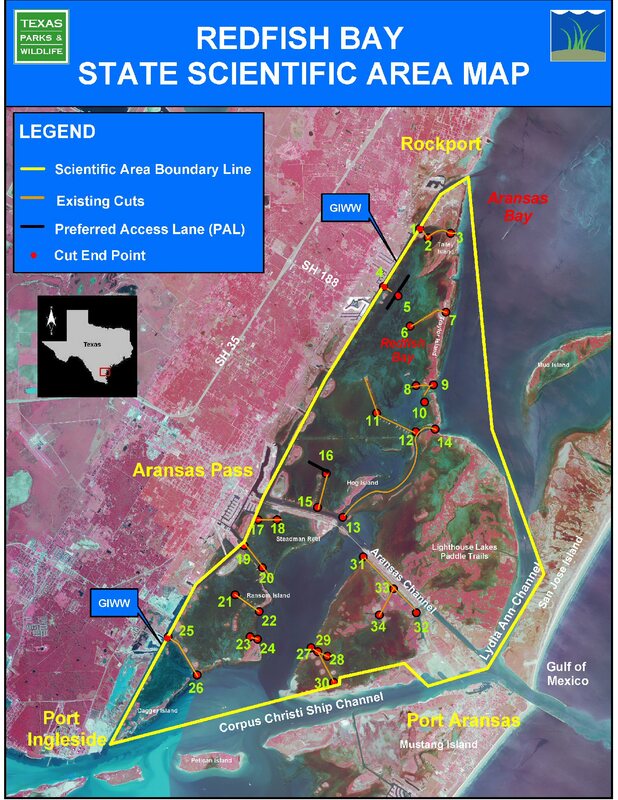 Research from the late 1990s showed that an area in Redfish Bay near Aransas Pass had already suffered extensive to severe scarring from boat propellers. Due to the damage found in this area and in response to TPWD’s 1999 Seagrass Conservation Plan of Texas, Redfish Bay was proclaimed a state scientific area in 2000 which includes 32,000 acres. For the next five years, voluntary "prop-up" zones were established to help boaters avoid further damaging seagrass habitat in the Redfish Bay State Scientific Area (RBSSA). But when voluntary efforts by boaters failed, mandatory regulations were created in 2006 that prohibited the uprooting of seagrass in RBSSA. 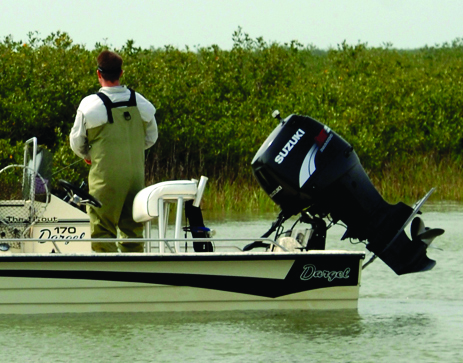 The TPWD Coastal Fisheries Division routinely monitored RBSSA to evaluate the effects of new regulations on seagrass. Fortunately, it was found that a significant reduction in propeller scarring occurred after mandatory regulations were passed in this area. Because of these promising results, in 2013 the Texas Legislature passed a statewide law making it illegal to uproot seagrass coastwide in Texas. Read more about the regulation authority. 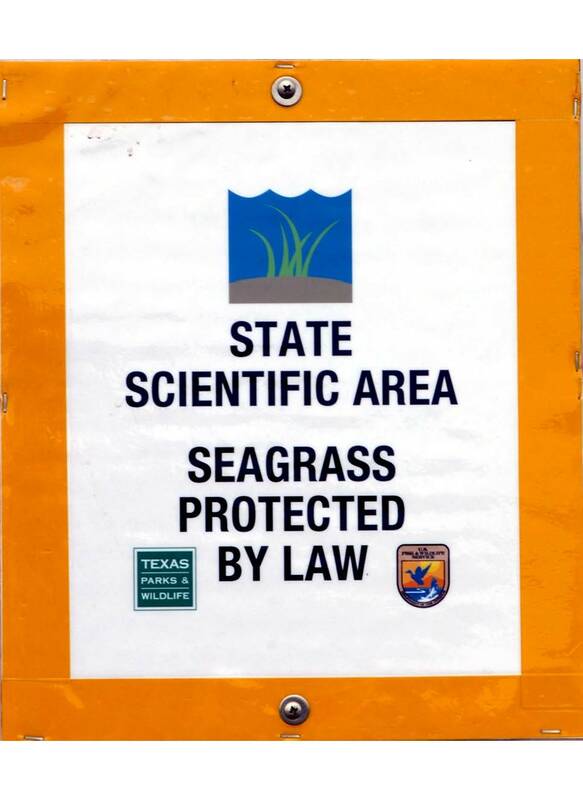 In June 2000, Redfish Bay was designated a state scientific area by the Texas Parks and Wildlife Commission to protect and study native seagrasses. The RBSSA contains the northernmost extensive stands of seagrass on the Texas coast. This includes 14,000 acres of submerged seagrass beds with all five species of seagrass found in Texas present. The RBSSA is a component of both the Aransas and Corpus Christi ecosystems and has about 50 square miles of prime fishing habitat. In three shallow and popular fishing areas, voluntary ‘prop-up’ zones were marked with posts and signs visible to boaters in the area from 2000 through 2005. However, these zones were largely ineffective in reducing seagrass damage. By May 1, 2006 the RBSSA ‘no-uprooting’ mandatory regulation took effect. This approach to protecting seagrass provided continued access to the entire area by the public but put the responsibility on the boat operator to boat responsibly. To help define the RBSSA, a number of signs have been placed in the water so that boaters can see the boundaries. In addition, information and boater regulations have been posted at local boat ramps. Boaters can see the boat ramp signs and read the text of the rules for boating in the area. There is a large downloadable map of the RBSSA that shows 34 cut points to access the area while minimizing the impact to seagrasses. There are also two tables of the latitudes and longitudes of each of those cut points that can be printed. One table is in degrees minutes and decimal minutes. The other is in degrees minutes and seconds. After four years of enforcing the mandatory 'no-prop’ regulation in RBSSA, a reduction in propeller scarring was achieved. This prompted the Texas Legislature to make it illegal to uproot seagrass coastwide beginning in September 2013. 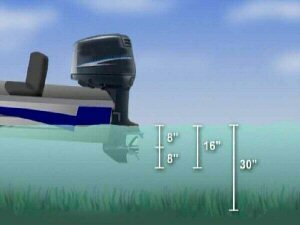 To educate the public about this new law, outreach efforts focused on teaching boaters to ‘Lift, Drift, Pole and Troll’ when boating through seagrass covered areas. Signs have been posted coastwide at marina and boat launch locations to remind boaters about the regulation and provide boating techniques to minimize negatively impacting seagrasses. In addition, TPWD has received donations from CCA, The Galveston Bays Foundation, and Lamar Signs to post billboards in several coastal locations in Texas. The Texas Saltwater Fishing Magazine has also graciously donated space in several issues for the ‘Uprooting Seagrass is Illegal ’ advertisement. 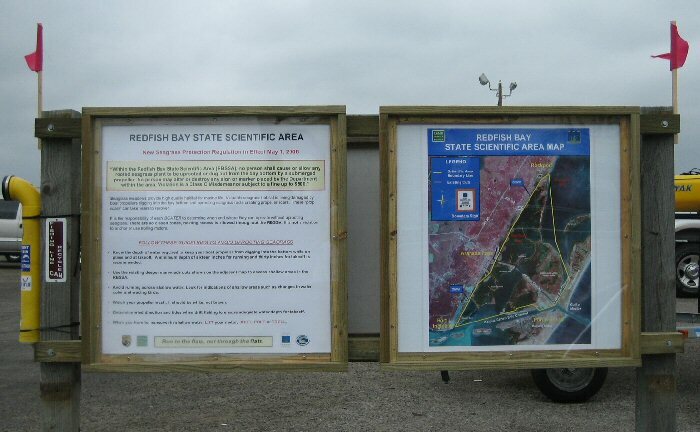 Since the inception of the Seagrass Protection Program that TPWD embarked on in 2005, Coastal Fisheries staff have participated in 629 outreach events, distributed over 75,000 brochures, made over 26,000 one-on-one contacts with the public for an overall total of 82.18 million outreach impressions made. A boater properly lifting their motor in a seagrass flat. Run TO the flats, NOT THROUGH the flats.